I’m not in the habit of posting sermons for a variety of reasons. Chief among the reasons is that a sermon is written for proclaiming, not for reading. I’m convinced the reader will find my manuscript quite boring given that I tend to preach in the neighborhood of 18-20 minutes. An essay of more than, say 750 words is, to me, sheer torture to have to read. But in light of my election to bishop last week, I felt a need to share some of what I experienced with the people I serve at the Lutheran Church of the Covenant as well as with the merely curious. I’ve been blessed. I am humbled. And I present this sermon with a great measure of humility, hoping that you may find it meaningful to you in some small way. As you might imagine, the last eight days have been a whirlwind for me. Prior to last weekend, I had my future more or less planned out in my mind. The synod assembly was just one more event on my schedule. Oh, sure, my name was on the list of nominees for bishop, but that was just a mere formality. I felt totally assured that the voting members to the assembly would pick someone much younger, much more energetic, much more dynamic. My name would be eliminated off the ballot after the first vote. Well, guess what? As each ballot progressed the possibility that my life, and that of my wife’s, would undergo a radical change became more and more of a reality. And on Saturday morning of May 17, somewhere around 11:30 a.m., it did. You can imagine the range of emotions that I experienced – shock, awe, terror, dread, and all its synonyms combined. To say that being elected Bishop of the Northeastern Ohio Synod of the Evangelical Lutheran Church in America was unexpected does not begin to describe it. I admit to you that at some point I felt very hypocritical. Here I was, called to be bishop, and regretting that I had ever allowed my name to go forward. Thinking of the responsibilities that the office entails, and how inadequate I felt to fulfill them. The hypocrisy comes in when I thought of all the times I stood in this pulpit and told you that God doesn’t call you because you are smart, or rich, or young, or good-looking; God calls you because you are called – pure and simple. So now it was time to put into practice what I preach. My thoughts, wildly racing by this time, also thought about having to stand in front of you and tell you that I would be leaving. I can’t speak for you, but last Sunday was among the most difficult days I’ve had to endure. I will not leave you orphaned. To set the scene for you, it is Passover. Jesus has shared a meal with his disciples knowing that in less than 24 hours, he’ll be dead – hung on a cross like a common criminal. He had begun the evening by washing his disciples’ feet, demonstrating for them the love of a servant; but also showing them that their relationship is defined by God’s love. He then began to tell them what was going to happen – that he would be arrested, tried, convicted and crucified; betrayed by one of them. Their world was falling apart.They were highly dependent on Jesus, and the thought of doing without him was very threatening for them. They felt powerless and alone. We’ve all read and heard how incompetent and faithless they can be. In the presence of Jesus they were like “little children” – they relied on his love and comfort. In fact, Jesus occasionally addressed them as “little children”. So it seems clear that without Jesus they would indeed be like orphans – lost and hopeless; their past cut off, their future completely uncertain. So who is this Holy Spirit? 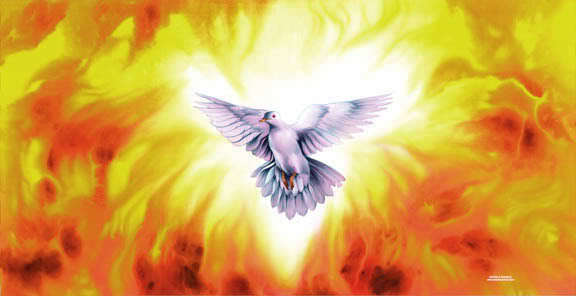 We are used to hearing about the Holy Spirit mostly around Pentecost. As a result, most of us have a very limited image of the Holy Spirit as the rush of a violent wind, tongues of fire descending on people’s head and enabling them to speak in other languages. But the Holy Spirit is much more than that. In our text, Jesus refers to the Holy Spirit as an Advocate or helper. The Greek word is parakletos. Translated literally, it means “the one called alongside” of another. Again, an advocate or a helper, one who brings help, consolation, comfort, and encouragement. Jesus says in our Gospel reading that he will ask the Father and God will send another Advocate. So Jesus makes it clear that he was the first Advocate. It was Jesus who came to earth to walk alongside us and show us what it means to be loved by God. And it is in the support, the care and the encouragement that we show to each other that we might come to know and see the otherwise invisible God. When Jesus spoke these words to his disciples, they were a hurting, confused, and disoriented bunch. They needed the Holy Spirit. How often in our lives do we experience the same feelings of hurt, confusion, and disorientation? Here are a few examples. This is Memorial Day weekend. Since this holiday was first established after the conclusion of the Civil War it has been a time to acknowledge those we have lost to war. We take time to remember members of our family that have died. We place wreathes at the gravesides of parents and siblings. In recent years we have also increasingly recognized all who have fought and sacrificed, those who have lost limbs or returned from their service with Post-Traumatic Stress Disorder. We have become more and more aware that the effects of war stretch far beyond the casualty list. Especially this weekend, we need the Holy Spirit! There are a lot of hurting, confused, scared, and disoriented people in our world today. Some of them right here in our midst. People who are feeling like orphans because they have a family member who is a deployed soldier. People who are feeling like orphans because they have lost a loved one to accidents, illness, or old age, and are remembering that person today. People who are lonely, scared, uncertain; feeling like orphans because a loved one, or even they themselves are facing illness and even death. People who are feeling like orphans because they feel unloved, needing a guiding hand, wanting someone to know their pain. Jesus’ words become our words to one another as people of God’s family, as we reflect the love and care of God into the lives of the people around us. Let Jesus inspire us to say to our fellow brothers and sisters, “I will not leave you orphaned. I will not leave you desolate, feeling deserted, alone, abandoned, unloved, hopeless, or futureless”. And if you need further encouragement, remember that you have a special connection to the office of the synod bishop. Believe me, I will remember you, and I’ll be relying on your prayers and encouragement. These are words of hope for you and me. 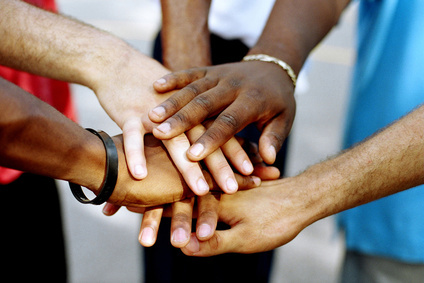 When we are feeling like orphans – feeling deserted, alone, abandoned, unloved, hopeless and futureless, remember that we have a Father who gives us his strength to keep on going, a Savior who whispers to us, “We are all in this together”, and we have the Holy Spirit who cheers us on and enables us to be helpers to each other. We are not abandoned because we have a God who loves us. He says to each of personally and individually, “I will not leave you orphaned”.